I just returned from William Holland School of Lapidary Arts, where I attended a Silver I class with instructor Pat Lillie. During the week I made a ring with a Larimar stone setting, a pendant with a Sodalite stone setting and a bracelet. 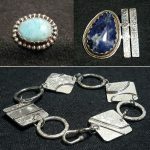 All three items are made in sterling silver.